Richmond Quarter is a stunning new six-storey development that aligns itself with the timeless elegance of East Fremantle. Featuring an elegant suite of residential apartments, this is the first and likely to be the only development of its kind in this suburb this century. Central to East Fremantle’s character is the loving preservation of its beautiful buildings and the careful fusion of the classic with the modern. And now, in keeping with the unique charm of the area, the site of the old Richmond Theatre is about to achieve the heights of its former glory, once again. Upon completion, Richmond Quarter will include a variety of stylish studio, one, two or three bedroom apartments centred around an open and airy European-style piazza, plus a boutique hotel with roof-top wine bar and outdoor cinema. 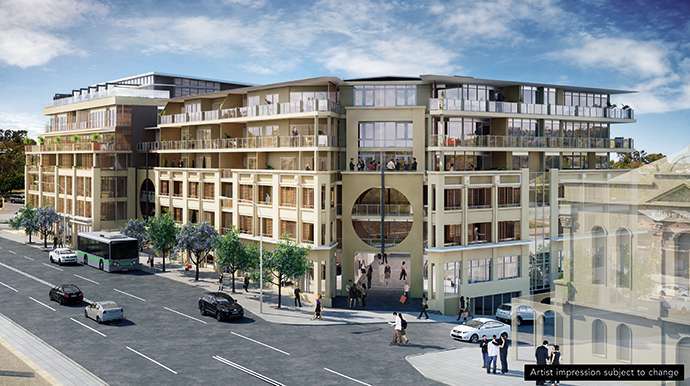 Richmond Quarter is a stunning new six-storey development in the Town Centre of East Fremantle that represents an outstanding opportunity to invest in commercial property. With Richmond Quarter’s suite of prime commercial premises integrated into a remarkable residential development, this is the first and likely to be the only project of its kind in this area for many years to come. It is why this is such a good investment. East Fremantle’s Town Centre already features an array of established food, retail, services and medical consulting businesses. Richmond Quarter will add a range of much needed and highly sought after commercial space into this already vibrant community hub. Added to this, your commercial property investment may attract twice* the rental return of a comparable residential property investment. Upon completion, Richmond Quarter will include a variety of high-exposure, commercial premises linked via an open and airy European-style piazza, plus a boutique hotel with roof-top wine bar and outdoor cinema.